The primary vocal ensemble of St. Hugo’s sings regularly at the Sunday 10:00 AM Mass and for select solemnities. This ensemble sings a repertoire of a capella and accompanied works across all stylistic periods. The choir is joined by chamber orchestra and brass at Christmas and Easter, as well as Christmas Lessons and Carols, concerts and special liturgies. Choir membership is open to individuals of high school age and older. Students in Jr. High will be considered through an interview, along with their parents, by the Director of Music. Rehearsals are on Thursday evenings from 7:30-9:15 PM (September-June.) 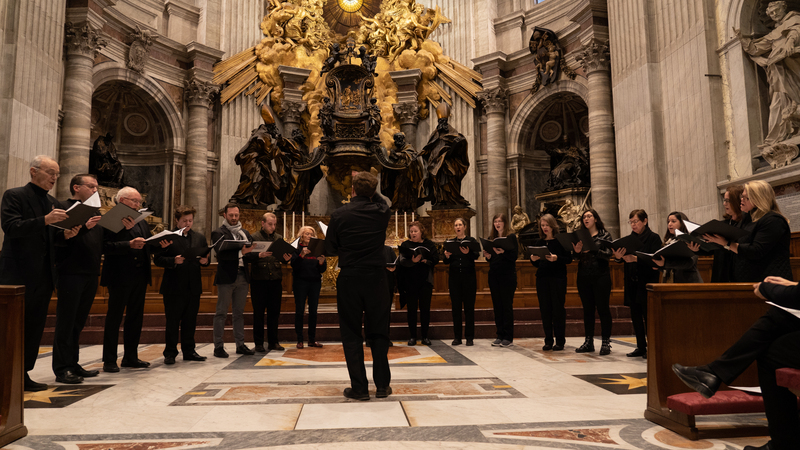 Members of the choir recently completed a pilgrimage to Rome, singing at St. Peter's Basilica and the Basilica of St. Andrea della Valle. This group of 12-14 singers specializes in the singing of unaccompanied choral music of the Renaissance period and of the present day. The ensemble sings for select liturgies and concerts throughout the year. Membership is open by audition when positions are open. This group of instrumentalists and singers provides music for the Sunday 5:00 PM Mass. The repertoire is drawn from various styles: praise and worship, Taize, "Gather", as well as Gospel. Membership is by audition. Cantors lead the assembly in song and usually proclaim the Responsorial Psalm. Membership is through audition. Excellent music reading and vocal skills are presumed. Contact the Director of Music for more information. Rehearsal, if needed, is by appointment. Cantors warm-up thirty minutes prior to Mass. For those who are 16 years of age or older, when positions are open. For children in Grades 3-8. This ensemble sings alone, and with the Liturgical Choir. The repertoire is drawn from various stylistic periods, from chant to contemporary music. The choristers learn a healthy, age appropriate vocal technique and are given instruction in the Church's liturgical life. All children are welcome! Rehearsals are on Tuesday mornings from 7:45-8:15 in the school music room, or, Sunday mornings immediately following the 10:00 am Mass (around 11:15) in the Church choir room. For children and youth in Grades 6-12. Singers are taught healthy vocal techniques, as well as a stable repertoire of cantor repertoire. Rehearsals take place as schedule. Open to Grades 5-8, these St. Hugo School students sing for school Masses, as well as occasional parish liturgies. ​​This male vocal ensemble of 5-10 singers ministers occasionally at Sunday Mass or Evening Prayer. ​Instrumentalists are always welcome to be a part of the music ministry. If you are interested, please contact the Director of Music for more information.